Multiple Sclerosis is the most common disabling neurological disorder affecting young adults. MS occurs as the result of damage to myelin - the protective sheath surrounding nerve fibres of the central nervous system. This damage interferes with messages between the brain and other parts of the body. You can call the MS-UK Helpline for free on 0800 783 0518 during weekdays, between 9 a.m. and 5 p.m. There are more than 50 centres in Britain and Ireland, including the Neuro Therapy Centre in Cheshire. BBC: What is multiple sclerosis? The library at The Brain Charity has a range of resources on MS and on a wide range of disability-related issues. 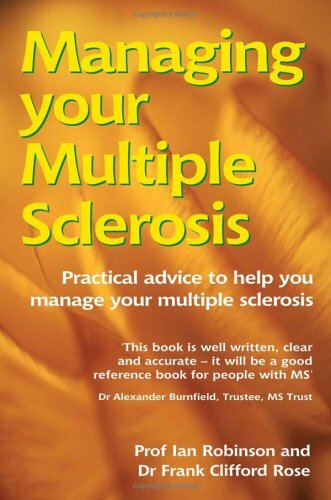 Visit our library to read Managing your Multiple Sclerosis: Practical advice to help you manage your multiple sclerosis by Professor Ian Robinson and Dr Frank Clifford Rose, and you can watch our copy of the MS Society's DVD for children Annie & Dan talk about MS.
Or have a look in your local library for Professor Robson's book.